Hello everyone! It's already Thursday? Ugh, this week is just flying by. Before I get into my card for today, I wanted to share some cool news. One of my cards was featured yesterday HERE at Paper Punch Addiction, which is a huge honor yet again. Thank you SO much, Kim! :) Please stop by and visit the site, there are some awesome ideas for using your punches. For my card today, I got my inspiration from the weekly technique challenge at "Just Us Girls". I have never tried the Spotlighting Technique before. It's just a really unique way to highlight a stamped image on a card. A link to a tutorial can be found HERE on Splitcoast, too. I have had the idea in my head that I wanted to use this hydrangea stamp from the Because I Care set, when I first saw this challenge last week. Today, I FINALLY had some time to put it all together. Just in time, the challenge ends tonight. Whew! After I got the "spotlight-ed" image all colored and shaded, it just felt like it needed something else. So I pulled out my new Nature Walk set and inked up the little bee. I do NOT like cutting tiny things out, by the way, and tend to avoid it at all costs. But this little "buzzy-dude" needed to add some dimension to the flower so there was NO way around it. GAH...time to use those dreaded paper snips! I also glittered up his wings and added some Crystal Effects to his head to give him some added pizazz, since he IS in the spotlight, after all. Fabulous job with the spotlighting technique! Beautiful card! Stunning card! Love the little bee ... great job cutting him out! I'm not a cutter too much either. The perfect bow finishes off this beauty very nicely! Love that spotlight technique! Lovely card. And congrats on being featured! Exciting news. Oh my that hydrangea is beautiful!!! WOW! Such a gorgeous card! What a wonderful take on the technique challenge! Thanks so much for playing along with Just Us Girls!! Beautiful card, love the spotlight technique, but forget it all the time. Love the coloring and that little bee, cute. Love, love, kitty cat, helping mom, he is just supervising. Wow - the card is awesome!! I love the spotlighting technique - although it's one I haven't tried yet...but I actually did think about it today as I was finishing up watercoloring an image - thinking I should of 'spotlighted' it! I love the bee and he deserved to be cut out! Your kitty is beautiful! Love the curled up paws! Off to check out paper punch addiction! Wowzers Anne Marie! Beautiful card & colors gf!!! I love how you did the spotlight technique. I wanted to play with that challenge but there's only so many days in a week LOL!!! Congrats on Paper Punch feature too! Awesome job!!!!! What a beautiful and unique spotlight design, Anne Marie!! Your card is gorgeous!! Congrats on being a featured artist on Paper Punch Addiction ... well deserved, I might add! Your card today is absolutely perfect ... perfect colour choices, perfect image choices, perfect embellishment choices ... did I mention that I think it's perfect ??!! Beautiful! I love the colors and how you used the spotlight technique. Gorgeous spotlight card! I love that embossing folder! Love this card! Great color choices and the use of spotlighting is great. Anne Marie - GORGEOUS! Your spotlighting is absolutely SPOT ON! I love the little bee alighting on the spotlit area, too. Just beautiful. Now.... Benjamin Maxwell.... well, he's just gorgeous, too! What an amazing photo. I swear I could reach thru this screen and tickle that little chin! 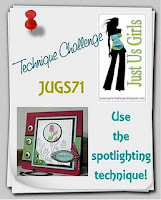 Beautiful spotlight card Anne Marie! Love that super sweet little glitter bee! And Benajamin Maxwell...isn't he as handsome as can be? They totally need punches for those stamps that we fussy cut all the time... *nodding* I hate fussy cutting... but do it way more than I want to. Thank you for visiting me. I so love it when you do. your comments inspire me to keep going! Love your cat's poses. He's perfect for the "Haz Ceezbrgr" photos!